Educators have discovered the power of makerspaces in schools to build students’ competencies and interest in science, technology, engineering and math. 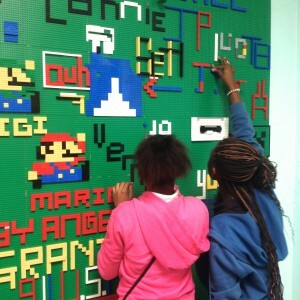 Guest blogger Diana Rendina, media specialist/school librarian at Stewart Middle Magnet School in Tampa, FL, describes how her school set up and uses a makerspace to support curricular goals and encourage STEAM skills. Stewart Middle Magnet School has been a STEM magnet school since 2000, but until recently, the library played little part in our magnet focus. When I became the media specialist 5 years ago, I set about to change that. As I began to learn about the maker movement and the role it could play in education, I knew that a makerspace would be the perfect fit for our library. I shared my vision with everyone who would listen and soon secured a donation of K’nex® that had been gathering dust in our science department storage room. 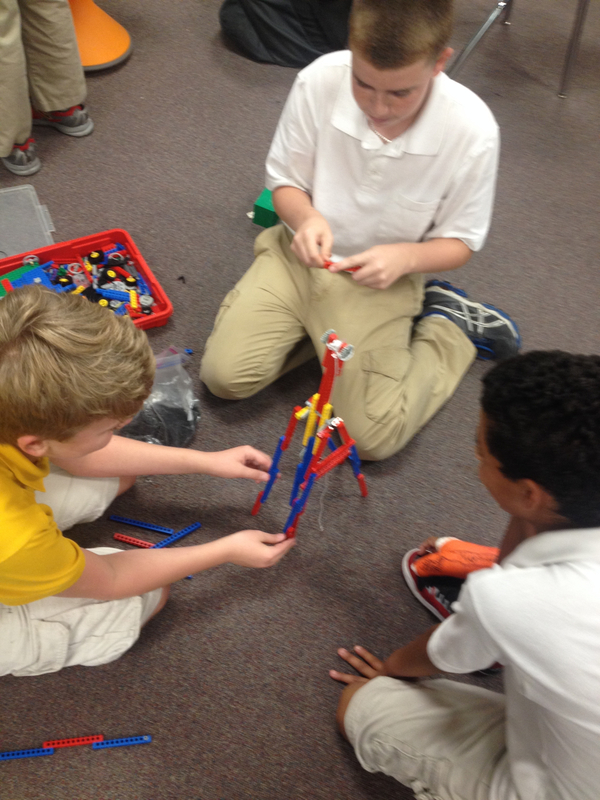 We started our makerspace in January 2014 with 3 bins of K’nex set out on library tables. Our students quickly embraced the concept, so we expanded by adding a variety of maker stations, including Snap Circuits®, LEGOS®, and arts and crafts. We soon realized that we needed a more permanent setup in order for our makerspace to grow. I gathered a group of students to form a Makerspace Planning Committee and give input and ideas for our space. 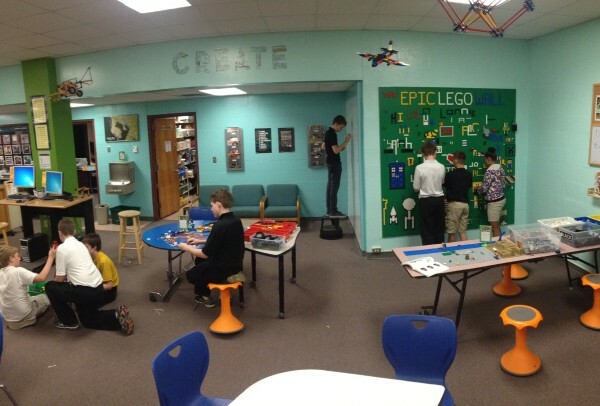 During the summer of 2014, we took down shelves, painted and transformed a corner of our library into our makerspace. Students building on the Epic Lego Wall. Our makerspace consists of an open area that takes up one corner of our library, as well as a storage room. 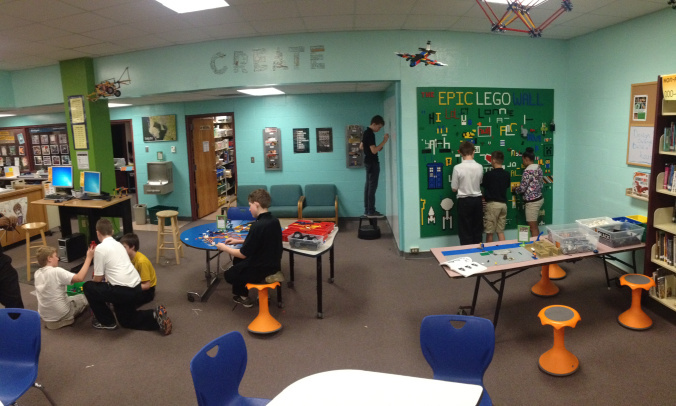 In the open area, students can build on our Epic LEGO Wall, create projects out of K’nex or doodle on our whiteboard wall and whiteboard table. This area is available to all students, all the time, with no prior experience needed. We converted an audio-visual storage room behind our open area into our Maker Room. This room includes plenty of empty shelves and bins for students to store in-progress projects. Students also can use tools and materials in this room, such as our littleBits™, MaKey MaKey™ kits, Cubelets and Spheros. This area tends to spill out into our library; you’ll often see students driving a Sphero through the stacks or tinkering with MaKey MaKey in the computer lab. Most of the tools in the Maker Room require a little prompting or guidance to use, but often you’ll see the students teaching each other. Our makerspace frequently has pop-up stations with curricular connections. We create signs with a design prompt for students near related materials. Our school is a NASA Explorer school, so leading up to our annual Space Week celebration, we created a Design a Rocket station with a challenge for students to build a rocket of their own design out of LEGOS or K’nex. We took photos and videos of the finished projects, and students voted on their favorites. Many of the projects were quite elaborate, including one with a solar panel charging area, a satellite storage bay and an elevator. I have made an active effort to collaborate with our science teachers. These collaborations are usually a hybrid of research activities and maker activities. This year, I worked with our marine science teacher for a unit on coral reefs. She introduced the unit to her students by showing them a video in class. The next day, the students visited the library and used written conversation strategies to explore 4 different articles about coral reef restoration. The articles were laid out at different tables and taped to butcher paper. The students rotated among tables, annotating the articles, writing questions and making observations. After a group discussion on the articles, students were challenged to design a model of an artificial coral reef out of LEGOS or K’nex. They had to be able to defend their design rationale with examples from the text. We documented their designs with Vine so that other students could see them. Our afterschool STEAM club consists of 10–15 students who gather in the library twice a week to work on projects. We usually focus on a design challenge, such as building an arcade game out of cardboard or designing a working catapult. Many of these challenges have been in collaboration with Colleen Graves’ students at Lamar Middle School in Texas. Our groups have met several times through Skype and Google Hangouts. At each meeting, we’ll share projects with one another and develop a new challenge together. We even got to participate in Google Hangout with some of the inventors of MaKey MaKey to learn about their design process. In our makerspace, our students are learning both formally and informally, discovering new things about science, engineering and more. They are gaining such skills as creativity, problem solving, and collaboration, and they’re having fun while doing it. Our makerspace truly is an invaluable STEAM resource for our school. 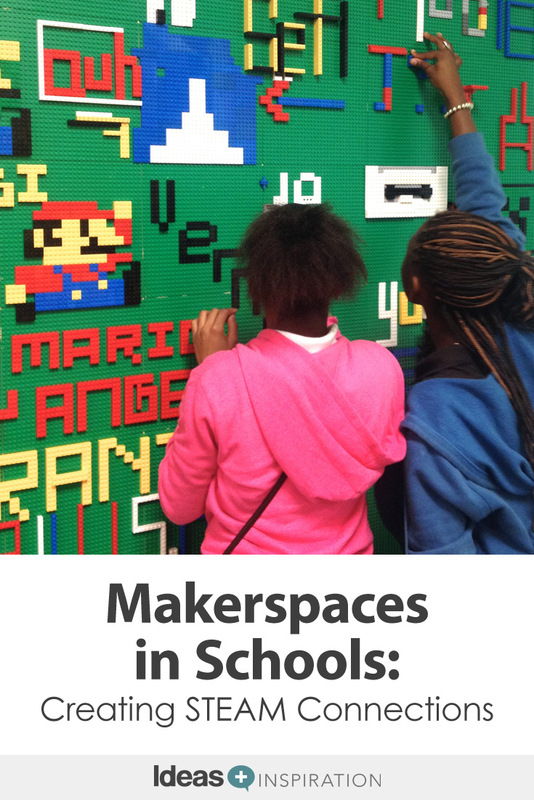 Learn more about school makerspaces and the projects at Stewart Middle Magnet School at Diana’s blog, Renovated Learning. Wonderful Article. I am looking at expanding my media center in the role of STEAM at my school and this is a wonderful resource. I would love to come and do a site visit at your school. Thank you, Michael, for your compliments! We are happy to bring you STEAM ideas directly from the experts and we wish you luck in your endeavors. As far as arranging a visit to Diana’s school, the best way to reach her would be through her blog site (a great resource for makers!). Thanks again! Glad you enjoyed the article, Mary! 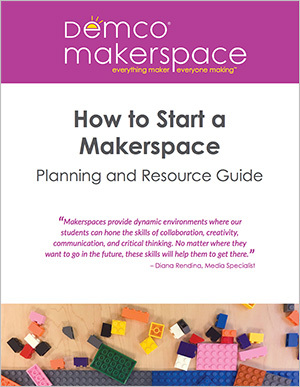 Check out Demco’s newest resource, makerhub.demco.com, where you’ll find hundreds of STEAM activities across grade levels.